Autumn is a time rife with Jewish holidays beginning with Rosh Hashanah, the spiritual new year, and ending with Simchat Torah, the holiday marking the completion of the annual weekly reading of the Torah. Interestingly, these holidays occur in Tishrei, the seventh month of the Jewish year, which is similar to the Sabbath falling on the seventh day of the week. Despite this, Jewish calendars begin and end with Tishrei, which tends to coincide with September or October. The foods most associated with Rosh Hashanah include round challah to symbolize the cyclic nature of the year and apples dipped in honey to represent the wish that we all have a sweet year. When I created the culture for Awan, I gave them similar holidays, though I renamed them to give myself room for adaptation. In the spirit of the fall holidays, I wanted to create a dessert appropriate for the Eshkol. 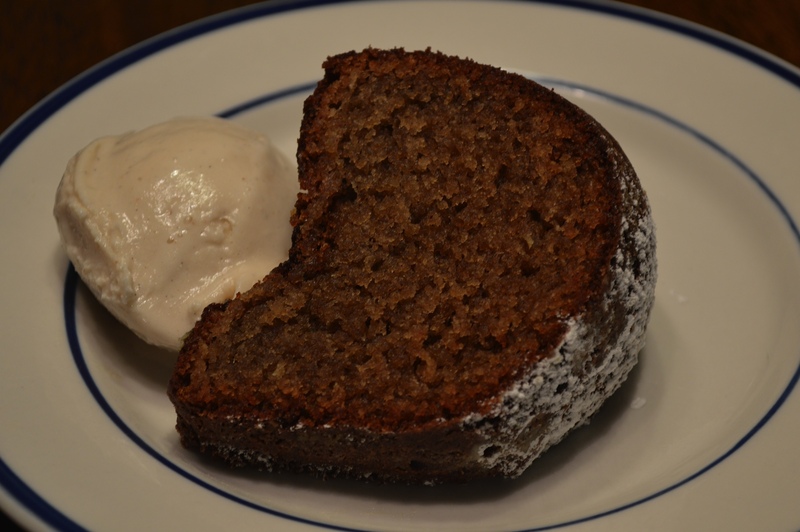 At first I considered creating a chocolate and red wine cake, but honey cake is the traditional Rosh Hashanah dessert. For what it’s worth, no one in my family likes the traditional honey cake because it tends to be too sweet. So when I stumbled upon Melissa Clark’s recipe for a red wine honey cake on the NY Times website, I thought it would be perfect for the Eshkol and knew I should make a gluten-free adaptation. In this version I blended gluten-free all purpose flour with almond flour. Gluten-free all purpose flour is itself a blend of garbanzo bean flour, potato starch, tapioca flour, white sorghum flour, and fava bean flour. This blend works well in baked goods if it is combined with a little xanthan gum to give the baked goods structure. I added the almond flour for the subtle flavor and because of its importance in Jewish cooking. During the Middle Ages, Jews were the only merchants trading in almonds, which may explain the prevalence of almonds in pastries in the cuisines of French Jews, my inspiration in the creation of the Eshkol tribe. 2. Beat the eggs and add the sugar, oil, honey, and wine. Mix well. 3. Whisk in the dry ingredients until smooth. (The batter will be thin, more of a liquid than usual for a cake.) Let the batter stand to thicken a bit while you . . .
4. Grease a 10-inch Bundt pan and coat lightly with flour to reduce sticking. Pour the batter into the pan and bake for about 45-50 minutes until a cake tester comes out clean and the cake springs back after being touched. 5. Allow the cake to cool in the pan for 15-20 minutes; then place a cooling rack over the top and turn it over to remove cake from the pan. Allow the cake to cool completely. If you wish, you may dust the cake with powdered sugar or do as Melissa Clark does and leave it “dark and ominous” served with macerated plums or another fruit.